This is a lovely recipe for an Italian Easter bread given to me by my sister-in-law Sarah many years ago. It’s a sweet, citrusy yeasted bread or cake, similar to panettone and not a million miles from a hot cross bun. Normally you divide the risen and knocked-back dough into four balls and put them side by side in a cake tin for their second rise. But because I like to make a rod for my own back – and because I thought they’d look pretty – I decided to make them in old clay flower pots instead (I did dishwasher them, honest, guv). You can go down either route. If you use flower pots, I would advise using ones no smaller than about 12 cm diameter and 9-10 cm high. I tried this with very small pots and I thought the loaves looked rather peculiar, tall and thin and the dratted things kept falling over. If you use a cake tin it should be about 18cm/7″ in diameter, well greased. 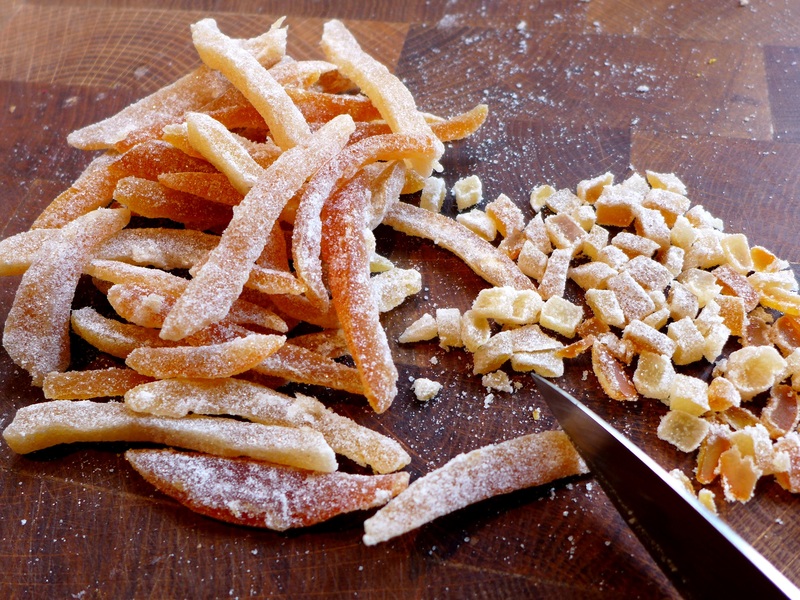 Oh, and a note on candied peel. If you can source it – and can afford it – those whole chunks or big strips of peel you can buy in some delis are nicer than the chopped stuff available in supermarkets, although the latter will do perfectly well for this recipe. You can make your own, of course, and it’s a lovely thing if you have the time but frankly there are only so many hours in anyone’s day. 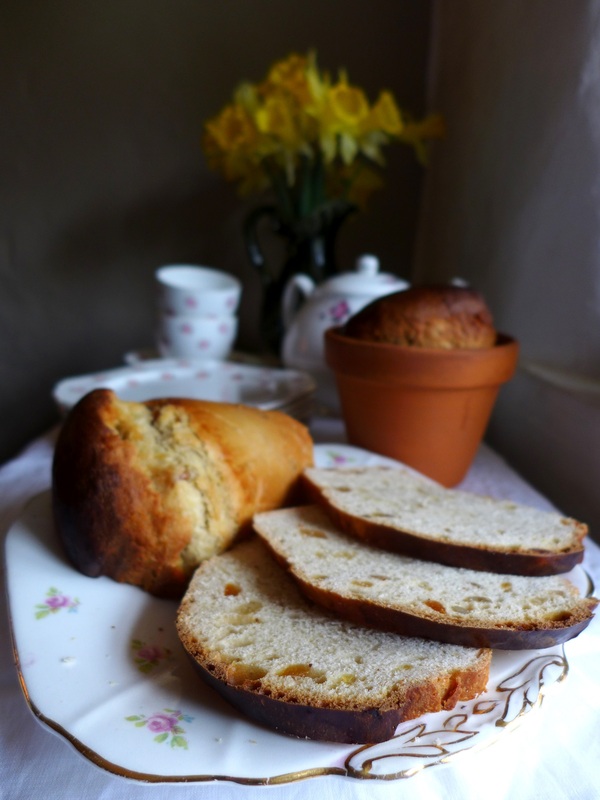 Happy Easter to you all and thanks for visiting/continuing to visit Mrs Portly’s Kitchen. Pull up a chair. I’ll put the kettle on, shall I? 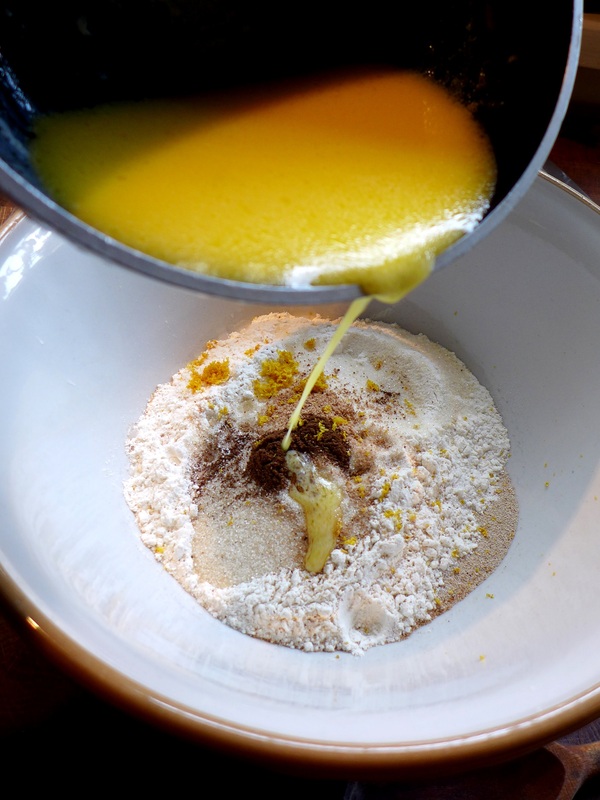 In a bowl, combine half the flour with the eggs, yeast, salt, sugar, spices and lemon zest. Heat the milk and butter together and allow to cool to blood temperature. Pour it into the bowl, mix thoroughly and leave for 20 minutes. You should see some bubbles rising. Add the remaining flour to form a soft dough, stir in the candied peel and knead for 10 minutes until you have a smooth, elastic dough. Place in a lightly oiled bowl, cover with a damp tea towel and allow to prove until doubled in size, about an hour to an hour and a half. Pre-heat the oven to 180C/350F/Gas Mark 4 and place a shelf just below the centre of the oven: they rise a lot during the bake. 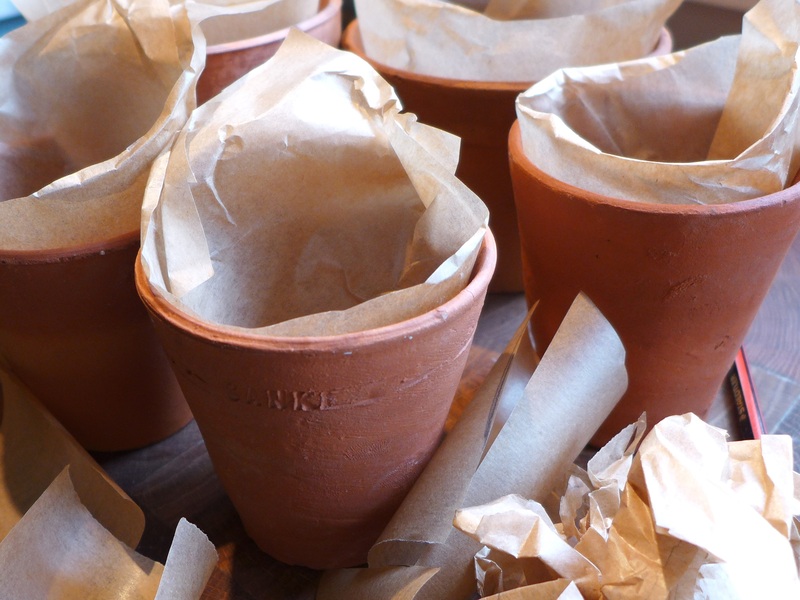 If you’re using flower pots, oil them thoroughly and line the bases and sides with baking parchment or silicon baking paper. Try to keep it reasonably smooth around the sides or you’ll get wrinkles and you can’t botox bread. When the dough has risen, punch it down and divide into four parts. Place in the flower pots/tin, cover again and leave to rise in a warm place for 30 minutes, then glaze with the beaten egg. Bake, depending on the size of your flower pots, for 30-40 minutes or until risen and golden (about 40-45 minutes if you’re using a tin). The loaves should sound hollow if you tap the bottom when you turn them out. Allow to cool in the pots for five minutes then remove them to a wire rack to cool completely. You can put them back into the pots for presentation purposes. Buttered or eaten as they are, they’re lovely for breakfast or, with a cup of good coffee, for elevenses or an afternoon snack. 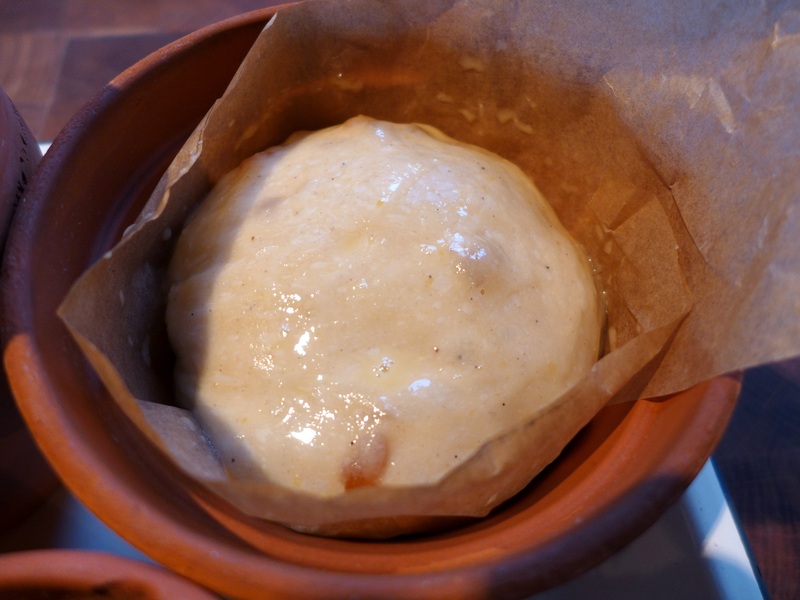 This entry was posted in Breads, Desserts, cakes and biscuits and tagged Easter recipes, fruited dough, Italian Easter Bread, Italian Easter Flower Pot Bread, sweet dough by Linda Duffin. Bookmark the permalink. these are so sweet! I’ve never ever thought of using pots!!! Thank you, Mimi. There was a fashion here way back in the ’70s or ’80s to bake bread in flower pots so I revived the idea for these sweet breads. Happy Easter! Creative award of the week goes to you Linda. Great job. Just like Scarlet, my hot cross buns are currently proving. 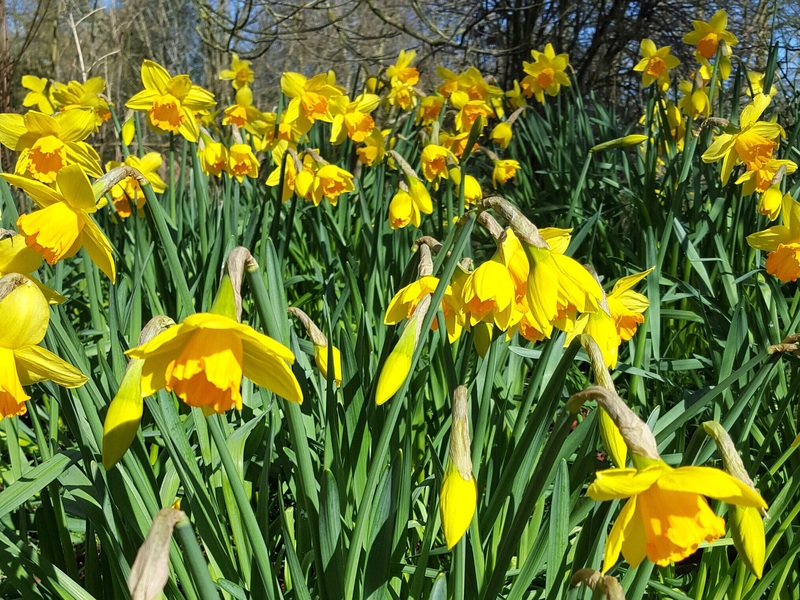 This could be a treat for next week, when the weather will be foul, and I may have the energy to scrub up a plant pot or two. Oh! Scarlet has ‘hot cross bunnies’. Mine are merely buns. How dull of me. Hope your buns turn out well, thanks, Margaret. Happy Easter! And happy Easter to you too! Gorgeous! I once saw a cheesy bread version of this in one of Jamie’s books. Very good-looking. It’s funny, there’s a restaurant here in the wilds of KY that’s famous for their bread in flower pots. (Ahem, yes, the ’70s never left.) But your Eastern version looks much much better. Eastern? Oh for the edit button… Happy Easter! Thanks, Vanesther, and good to see you’re settling in to your new life in Bristol. Sounds like a blast! Linda, you are incredible! 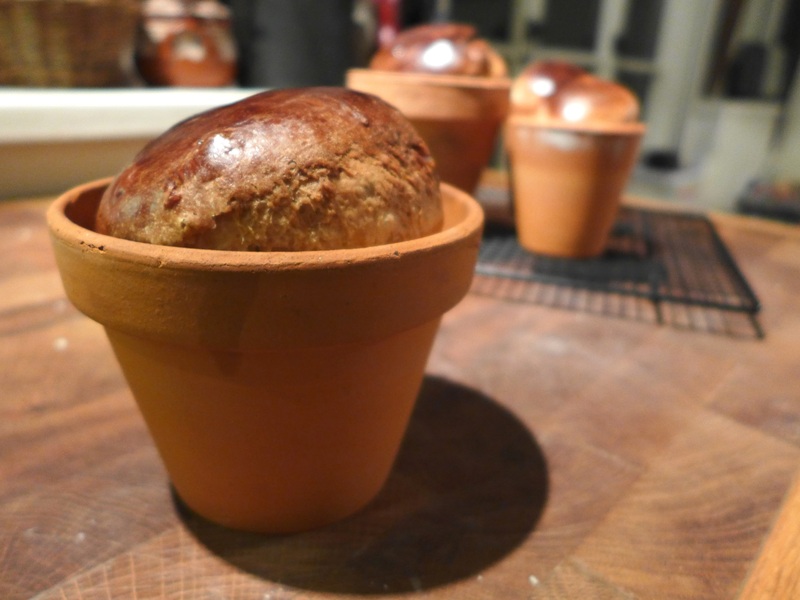 Using clay pots as springtime loaf pans is truly inspired. I wish I had read this before I made my Easter bread this year. What a great idea — and that loaf ain’t bad either! It sounds wonderful. Have you used it to make pain perdu or bread pudding? I buy extra panettone just for those dishes once the holidays are but a memory. I’m running late, as always, but I do hope that you and your family shared a wonderful Easter. Thanks, John, we had a lovely time with the family, hope you did too. Using up the leftover loaf as pain perdu is a genius idea, thanks. I’m not fond of bread pudding but I imagine it’d make a good trifle base as well. I can’t take the credit for the idea of using flower pots but they do look cute, don’t they? And of course retain the heat as you’re baking.